Something that may be noticeable is that a lot of my pictures are of handicapped drivers; but what can I say? They tend to be the worst parkers. I hate saying that because it's mean, but it's just true. 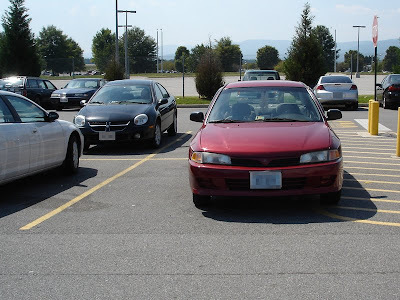 If there's one thing I've learned while working in a parking lot, it's that 40-50% of handicapped drivers either don't know how to park, or just don't care. The way I see some people pull in is just unbelievable; If I ever get a chance I'll start posting videos of people's bad parking. All that being said, this driver isn't handicapped, but that only makes his sad excuse for a parking job that much worse.